This is a story about a potato chip tree I made for a guy at work who I'll call Broke Back Boy because he hurt his back. Don't worry, Broke Back Boy's okay. This story is a happy one because he recovers quickly AND he gets a potato chip tree! The Potato Chip Tree got me great compliments like, 'You're weird.' from the recipient and 'So random' by some one else. Even I think it's a bit ridiculous. I don't know how my brain leapt to a chip tree but I started at - oh no, he's hurt. Then, I should do something nice. Food obviously. Followed by, the freak doesn't eat chocolate. Opposite of chocolate? Potato chips. That's boring. [i don't understand this leap to] Potato Chip Tree! Initially I was going to stick them on a weighted bottle (probably coke) but at the supermarket I discovered multi-pack chips come in boxes now. I don't eat small [read: recommended] servings - Little Sissy Pham and I can hoover a 175g party pack in one sitting... each. So I bought a Red Rock Deli multi-pack because the box assured me it had 'adult servings' inside and I'm always telling myself I should be more grown up. 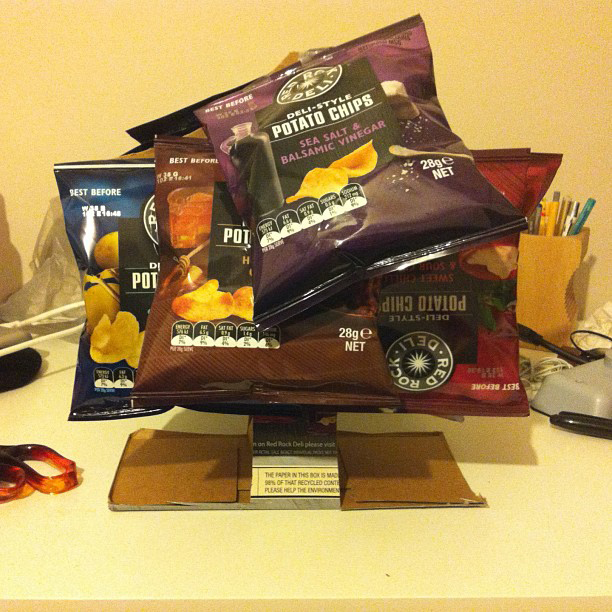 The Potato Chip Tree is the chip packs stuck on the outside of their box, which I cut into the shape of an Xmas tree, stapled branches together to centre the weight then added a rolled up bit of box cut-offs in the base to make the tree trunk stronger. All the bags are held on by sticky tape and I made a complete mess of it taping bags to bags and branches and other bags... good luck plucking the chip packs off, Broke Back Boy. Get well soon!